As of today, November 26, Blake has been away from home on temporary assignments for 101 days of this calendar year. He's had short trips to Okinawa and Sasebo, both in Japan. Another short trip took him to Guam, and I was able to join him for the weekend after, which was really nice. His longest assignment was for a few months to South Korea, so we essentially lived in separate countries for some time. I was able to take three different trips to visit him while he was there, which was a great blessing and I've come to really enjoy and know Seoul more than I ever planned to, even after two trips there last year. We tend not to broadcast that he's away during those times. I live in a secure place (a foreign military base is a well guarded gated community), but we still don't like to make a big deal of my being alone. Our ward and command and families know, so that we can both receive support, and we generally don't keep it a secret from anyone else if it comes up, but who we tell what information to is related to both Operational Security (OPSEC) and Personal Security (PERSEC). Even I don't get to know everything every time for those reasons. It's fortunate that Blake's job isn't so secretive that I can't know anything. I know of families whose military member just disappears sometimes to do their jobs and know one knows where they are or when they will return and certainly not what they are doing. I know of marriages that have ended because of it. Comparatively, I know quite a lot about Blake's comings and goings and we can prepare for our separations. For most of his time away so far, we've been able to talk regularly, usually daily, at least via text messages if not via phone or video chat. We can orchestrate playing games together online and or simultaneous viewings of streaming movies or tv shows. During one night while he was in Korea, we even went to the movie theaters on our respective bases and saw the same movie and had the same dinner (thank you chain restaurants). so it was almost as good as an in person date, just with less hand holding. We keep up with our family scripture study schedule and keep each other as informed as OPSEC will allow about what we're up to each day, just as we would if he were home, so that we can stay involved in each other's lives. 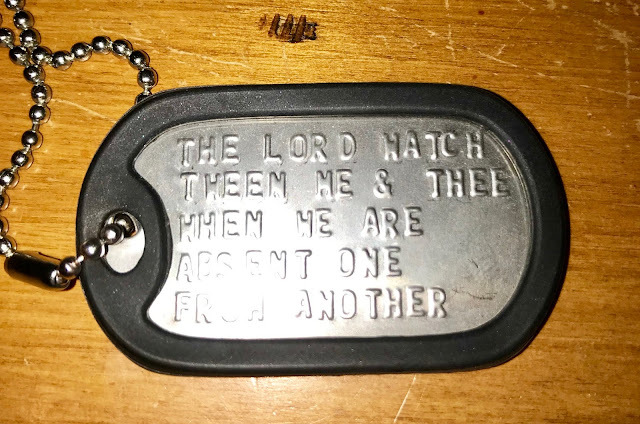 Genesis 31:49 - I commissioned this from an Etsy seller who makes custom dog tags. When he realized what it was for and that we were a Navy family, he included two chains and thanked us for our service. Blake wears his with his regular dog tags. I believe in some ways I was prepared for this - I lived alone for more than three years before we got married, so I am very comfortable doing so when the Navy requires it. I'm independent and self-sufficient, possibly to a fault, so I know I can handle things while he is away. That's not to say it isn't hard sometimes. It definitely is. We miss each other like crazy. But we make it work and the times we are together are that much sweeter. 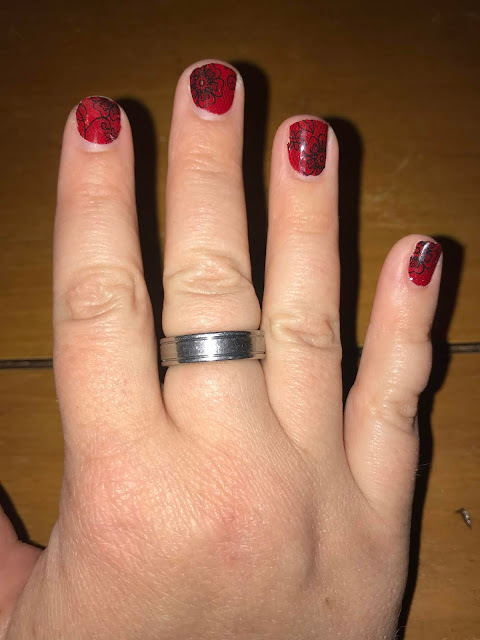 For assignments that require him to work on a ship, he wears a silicone ring, so I wear his titanium one. Today, Blake left for what could be his longest assignment to date. It's an incredible learning opportunity, for both us really, and one we've been aware of for over a year. Even when it wasn't an entirely sure thing, we've prepared and readied ourselves to be apart for awhile. We're going to miss to each other, as we always do, but we know this what we need to do right now. Our command, families, ward, and friends are all very supportive and this is going to be worth it. This is what we signed up for when we joined the Navy. Blake is the one who wears the uniform, but we're both in this together. We didn't know the full extent of it, but we're learning and looking forward to wherever this adventure takes us! My dad was in the Navy before he and my mom got married. 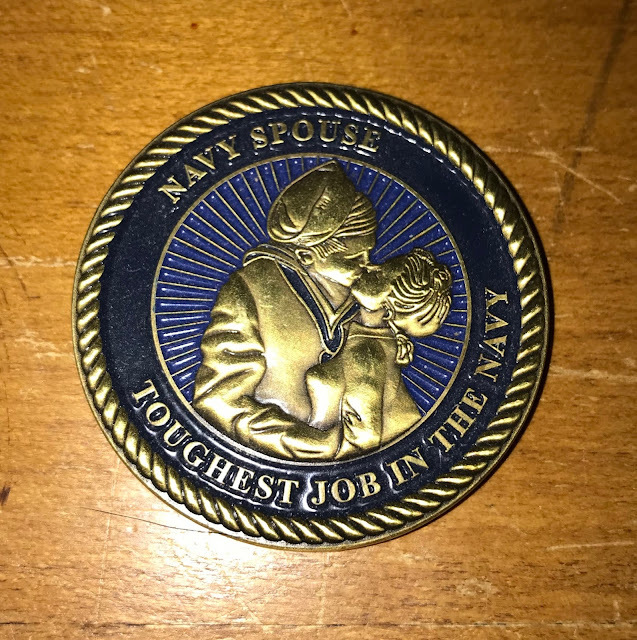 I have two uncles who were career Navy, one of whom had 4 sons who are also career Navy. Of those 4, 2 are retired pilots (both served in the Gulf War), one is an active pilot currently stationed in Germany, and 1 is a retired SEAL. Very often, their wives (especially the SEAL's wife) didn't know where they were or when/if they'd come home. It's not an easy job, and the women who can stick it out with faith and love are remarkable. I admire both of you. <3 And Go Navy. How does she know you love her?